Despite intensive effort, the antitumor efficacy of tumor vaccines remains limited in treating established tumors regardless of the potent systemic tumor-specific immune response and the increases of tumor infiltration of T effector cells. In the current study, we demonstrated that although lentivector (lv) immunization markedly increased Ag-dependent tumor infiltration of CD8 and CD4 T cells and generated Ag-specific antitumor effect, it simultaneously increased the absolute number of myeloid-derived suppressor cells and regulatory T cells in the tumor lesions. In addition, lv immunization induced expression of programmed death-ligand 1 in the tumor lesions. Furthermore, the tumor-infiltrating CD8 T cells expressed high levels of programmed death-1 and were partially dysfunctional, producing lower amounts of effector cytokines and possessing a reduced cytotoxicity. Together, these immune-suppression mechanisms in the tumor microenvironment pose a major obstacle to effective tumor immunotherapy and may explain the limited antitumor efficacy of lv immunization. The loss of effector function in the tumor microenvironment is reversible, and the effector function of CD8 T cells in the tumor could be partially rescued by blocking programmed death-1 and programmed death-ligand 1 pathway in vitro and in vivo, resulting in enhanced antitumor efficacy of lv immunization. These data suggest that immunization alone may exacerbate immune suppression in the tumor lesions and that methods to improve the tumor microenvironment and to rescue the effector functions of tumor-infiltrating T cells should be incorporated into immunization strategies to achieve enhanced antitumor efficacy. Tumor vaccines have great potential for treating malignant tumors due to their activation and expansion of tumor-specific T cells that can recognize and kill target tumor cells. The presumption that T cell priming is insufficient has led to intensive efforts to improve immunization strategies including peptide-based (1), dendritic cell-based (2), and gene-based tumor vaccines (viral vectors and DNA) (3, 4). We and others previously found that cutaneous immunization with lentivector (lv) could effectively transduce skin dendritic cells and stimulate potent Ag-specific CD8 T cell responses (5–9). We further showed that lv expressing self-tumor Ag, tyrosinase related protein 1 (TRP1), induced potent CD8 T cell responses and markedly increased tumor-infiltrating lymphocytes (TILs) into B16 tumors (10). However, despite intensive efforts, the therapeutic antitumor efficacy of vaccine-based immunotherapy in treating established tumors is limited (11). Reports on human cancer patients also found that the tumors continued to grow despite the presence of high numbers of tumor-specific T cells (12–15). These findings suggest that the established tumor microenvironment is potently and dominantly immune suppressive and that the effector functions of CD8 TILs may be impaired (16–19). Indeed, multiple suppressive mechanisms including regulatory T cells (Tregs) (20–22) and myeloid-derived suppressor cells (MDSCs) (18, 23) were reported to inhibit the function of T effector (Teff) cells. In addition to these extrinsic immune-suppression mechanisms, the latest studies showed that CD8 TILs expressed programmed death-1 (PD-1) (24, 25), which was implicated in tumor evasion (26, 27) and contributed to immune suppression in the tumor microenvironment (28). Although the current efforts toward tumor vaccines are focused on improving the magnitude of tumor-specific Teff cells, scant attention has been paid to studying how immunization will affect the immune-suppressive tumor microenvironment and whether vaccine-activated T cells can retain their effector function after entering into tumor lesions. Although lv immunization stimulates potent T cell immune responses, it is not clear what effect lv immunization will have on immune suppression in the tumor microenvironment. The fact that potent systemic CD8 T cell responses and marked increase of TILs after lv immunization are unable to eradicate established tumors (10) prompts us to hypothesize that immunization fails to relieve immune suppression in the tumor lesions and that the effector function of CD8 T cells in the tumor microenvironment may be compromised. To test this hypothesis, in the current study we investigated the immunological changes including the immune effector and regulatory cells in the tumor microenvironment after lv immunization and whether measures of tackling the immune-suppression mechanisms would enhance the antitumor efficacy of lv immunization. We found that lv immunization markedly increased the tumor infiltration of CD8 and CD4 Teff cells but also attracted more Tregs and MDSCs into the tumor lesions. In addition, immunization increased programmed death-ligand 1 (PD-L1) expression on both tumor cells and leukocytes in the tumor lesions. Furthermore, CD8 TILs expressed a high level of PD-1 and low amounts of IFN-γ and TNF-α and were compromised on degranulation. These data demonstrate that multiple immune suppression mechanisms dominate the tumor microenvironment and that immunization may further accentuate the suppressive tumor microenvironment by attracting more MDSCs and Tregs to tumor lesions and by increasing PD-1/PD-L1 engagement. 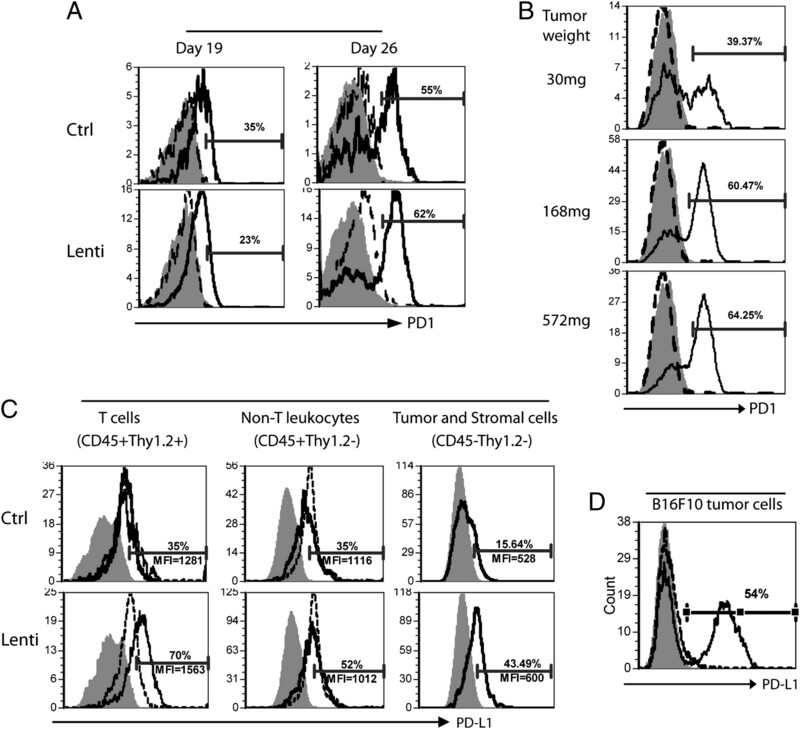 Blockade of the PD-1 signaling partially recovered the effector functions of TILs and enhanced the antitumor efficacy of lv immunization, providing a strong rationale for the combinatorial tumor immunotherapy of integrating immunization strategies with approaches of diminishing immune suppression in the tumor microenvironment to achieve effective therapeutic antitumor effect. The B16F10, MO4 (OVA expressing B16F10) tumor cells, and 293T cells were cultured in DMEM medium. Pmel-1 TCR transgenic mice were purchased from The Jackson Laboratory (Bar Harbor, ME). C57BL/6 mice were obtained from the National Cancer Institute (Frederick, MD) and The Jackson Laboratory. All the mice were housed under specific pathogen-free conditions at Laboratory Animal Services of the Medical College of Georgia. Animal care protocols were approved by the Institutional Animal Care and Use Committee of the Medical College of Georgia. To establish tumors, B16F10 cells (1 × 105) and MO4 cells (2 × 105) were inoculated s.c. into the shaved flank of C57BL/6 mice. OVA-lv and TRP1-lv lvs and OVA-adenoviral vector (Ad) were prepared as previously described (5, 6, 10). Lv expressing melanoma Ag, human gp100 (hgp100) Ag, was constructed by replacing the TRP1 gene with hgp100 gene. Lvs were prepared and titered as we previously described (10). For immunization, TRP1-lv, hgp100-lv, and OVA-lv were injected via footpad at doses of 2.5 × 107, 1.5 × 107, and 3 × 106 transduction units, respectively. Twenty million PFU of OVA-Ad were used for immunization to elicit similar magnitude of CD8 responses as 3 × 106 transduction units of OVA-lv. All immunization was conducted 5 d after tumor inoculation when tumor lesions were clearly visible. Volumes of 50 μl were used in all experiments. TCR transgenic hgp25–33 specific Pmel-1 T cells were isolated from transgenic mice by magnetic beads (Miltenyi, Auburn, CA). Because the precursor frequency affect the effector function and quality of immune responses (29), an optimal dose of 0.5 million to 1.0 million pmel-1 cells was injected into mice 1 d prior to tumor inoculation. The Abs used in this study, anti-CD45, anti-CD90.2 (Thy1.2), anti-CD8, anti-CD4, anti-CD11b, anti–Gr-1, anti-CD107a, anti–PD-1, anti–PD–L1, anti-FoxP3, anti–IFN-γ, and anti–TNF-α, were purchased from BD Biosciences (San Diego, CA), Biolegends (San Diego, CA), and eBioscience (San Diego, CA). Tumors were collected and weighted, and single-cell suspensions were prepared (10). Briefly, 10–100 mg tumor was cut into small pieces and incubated at 37°C for 0.5 h in RPMI 1640 containing 1 mg/ml collagenase, 1 mg hyaluronidase, and 100 U DNase I. All enzymes were from Sigma (St. Louis, MO). To isolate Tregs and MDSCs, tumor cell suspensions were loaded onto Percoll gradient (GE Healthcare, Piscataway, NJ). Enriched lymphocytes were isolated by cell sorting (FACSAria, BD Biosciences). To measure cytokines, cells were stimulated with peptides in vitro for 3 h in the presence of GolgiStop (BD Biosciences) as described (10). For some experiments, αPD-L1 (clone 10F.9G2 from BioXcell, West Lebanon, NH) and αPD-1 (clone RMPI-14) (30) Abs were added to a final concentration of 1 μg/ml. Intracellular staining of IFN-γ and TNF-α was performed (6). Alternatively, to measure the extent of degranulation, anti-CD107a Ab was added to the ex vivo cell culture as described (31). Cells were collected using a FACScanto (BD Biosciences). Data were analyzed using FCS Express V3 software (De Novo Software, Los Angeles, CA). To study the effect of PD-1 and PD-L1 blockade on the antitumor efficacy of lv immunization, 200 μg αPD-L1 and αPD-1 or rat IgG isotype control Abs were injected into mice i.p. on the same day of immunization and continued every other 2 d.
Inhibition of T cell proliferation by Tregs and MDSCs was conducted as described previously (32). Briefly, 50,000 magnetic bead-isolated CD4 T cells were labeled with 0.1 μM CFSE and then cocultured with 10,000 CD11c+ dendritic cells (isolated by magnetic beads) with or without 50,000 sorted MDSCs or Tregs in the presence of 0.5 μg/ml CD3 Ab. After 72 h, CD4 T cell proliferation was determined by the dilution of CFSE using flow cytometry analysis. The statistical significance of the experimental data were analyzed using unpaired two-tailed t test (GraphPad Software, La Jolla, CA). We previously found that lv TRP1-lv immunization markedly increased T cell infiltration into tumor lesions and inhibited tumor growth (10). To study whether the T cell infiltration was Ag driven and dependent, we established both B16F10 and MO4 tumors in the same mice, which were then immunized with either TRP1-lv or OVA-lv. Both TRP1-lv and OVA-lv stimulated potent CD8 T cell responses, and IFN-γ+ CD8 T cells could be detected in the peripheral blood of immunized mice (Fig. 1A). To achieve similar magnitude of CD8 T cell responses, ~8–10 times more TRP1-lv than OVA-lv was used. When the TIL was analyzed, we found that infiltration of CD4 and CD8 T cells in B16F10 tumor lesions was markedly increased by TRP1-lv but not by OVA-lv (Fig. 1B, 1C). On average, CD8 T cell infiltration increased 15-fold compared with 8-fold increase of CD4 T cells after TRP1-lv immunization. In contrast, both TRP1-lv and OVA-lv lv increased CD8 and CD4 T cell infiltration into MO4 tumors (Fig. 1B, 1C) because MO4 tumors express both TRP1 and OVA Ag. Consistent with the tumor infiltration data, B16F10 tumor growth was strongly inhibited by TRP1-lv but not by OVA-lv immunization, and the B16F10 tumor masses were significantly smaller in the mice treated with TRP1-lv than in those of control or OVA-lv treated mice (Fig. 1D). Not surprisingly, the antitumor effect of TRP1-lv immunization was found in both B16F10 and MO4 tumor models, whereas OVA-lv was only able to inhibit growth of MO4 tumors but not the parental B16F10 (Fig. 1D). These data strongly indicate that lv immunization induces Ag-dependent T cell infiltration and tumor growth inhibition. Lv immunization stimulates Ag-dependent tumor infiltration of CD8 and CD4 T cells. Mice bearing 5-d B16F10 and MO4 tumors were immunized with either TRP1-lv or OVA-lv. A, Systemic immune responses were examined on day 14 after immunization. The numbers in the parentheses in the upper right quadrants indicate the percentage of IFN-γ+ CD8 T cells of total CD8 T cells in the peripheral blood. A summary of the systemic CD8 responses of five mice is presented on the right. B and C, Single-cell suspensions from tumor lesions were stained for CD45, Thy1.2, CD4, and CD8. Alive cells were gated based on the forward and side scatter. A representative plot from each group is presented (B). The numbers in the upper right quadrants of the top panel plots represent the absolute numbers of Thy1.2+ T cells (gate 4). The T cells (CD45+Thy1.2+) were then analyzed for CD8 and CD4 (lower panels of B). The absolute numbers of total CD8 and CD4 T cells were calculated based on the tumor weight used and the cell numbers in each analysis. Data of three experiments are summarized and presented as mean ± SE (C). D, The tumor weight was recorded at the end of the experiment when mice were sacrificed. A cohort result from three experiments is presented (B16F10-Ctrl: 8 tumors; B16F10-TRP1: 12 tumors; all other groups: 5 tumors). Nonpaired t test was used for statistical analysis. To investigate the dynamic changes of immune suppression in tumor lesions, Tregs and MDSCs were analyzed at different time points after inoculation of B16F10 tumor cells. In 5-d tumor lesions, ~14% of the CD4 TILs was Tregs, whereas 12% of the non-T leukocytes (CD45+Thy1.2−) was CD11b+Gr-1+ MDSCs (Supplemental Fig. 1). By day 12 after tumor inoculation, ~30% of CD4 TILs was Tregs, and 50% of non-T leukocytes was MDSCs. The data demonstrate that the MDSCs and Tregs are accumulated rapidly in the tumor lesions. Then, the impact of lv immunization on the accumulation of MDSCs and Tregs in the tumor lesions was studied. Lv immunization did not alter percentage of MDSCs in the tumors. But, the absolute number of MDSCs in B16 tumor was markedly increased (~6-fold) by TRP1-lv (but not OVA-lv) immunization (Fig. 2A) due to the influx of leukocytes. Similarly, the absolute number of Tregs in B16 tumor increased ~5-fold by TRP1-lv (but not by OVA-lv) immunization even though the percentage of Tregs was significantly reduced (Fig. 2B). On the other hand, MDSC and Treg accumulation in the MO4 tumor lesions was found after both TRP1-lv and OVA-lv immunization (Fig. 2C), consistent with the Ag-dependent Teff cell tumor infiltration (Fig. 1B, 1C). These data suggest that the increase of tumor infiltration of MDSCs and Tregs may be related to the expression of tumor Ag but not lv per se. In agreement with this hypothesis, OVA-Ad, immunization also increased MDSC and Treg accumulation in the MO4 tumor lesions (Fig. 2D). Accumulation of MDSCs and Tregs in tumor lesions is accentuated by immunization in an Ag-dependent manner, A and B, Mice bearing 5-d B16F10 tumors were immunized with TRP1-lv. Single-cell suspensions from tumors were prepared 15 d after immunization and stained for CD45, Thy1.2, CD11b, and Gr-1 (A) or CD45, Thy1.2, CD8, CD4, and FoxP3 (B). Representative plots of MDSCs and Tregs are presented. The percentages and absolute numbers of MDSCs and Tregs are summarized. Unpaired two-tailed t tests were used for statistical analysis (Prism; GraphPad). C, Mice bearing 5-d MO4 tumors were immunized with either TRP1-lv or OVA-lv. The absolute number of MDSCs and Tregs in the tumors was analyzed and calculated 15–18 d later. Experiments in A–C were repeated three times with similar observations. D, Mice bearing 5-d MO4 tumors were immunized with lv OVA-lv (lv) or OVA-Ad (Ad). The absolute number of MDSCs and Tregs in the tumor lesions was analyzed and calculated 16–18 d later. The experiment was repeated twice with similar data. E, The immune-suppressive function of MDSCs and Tregs was determined by their inhibition of αCD3-induced CD4 T cell proliferation in vitro. Only the CFSE+ CD4 T cells were gated and analyzed. The numbers on each histogram indicate the percentage of dividing and undivided cells. This experiment was repeated twice with similar results. Compared with the MDSCs and Tregs in the tumor lesions, which can reach 50 and 30%, respectively, spleen contained a significantly lower level of MDSCs (~10%) and Tregs (~8%). Whereas tumor growth moderately increased MDSCs and Tregs in the spleen, immunization did not cause further increase of accumulation (Supplemental Fig. 2). The function of MDSCs and Tregs that accumulated in the tumor lesion was determined by their in vitro inhibition of CD4 T cell proliferation. 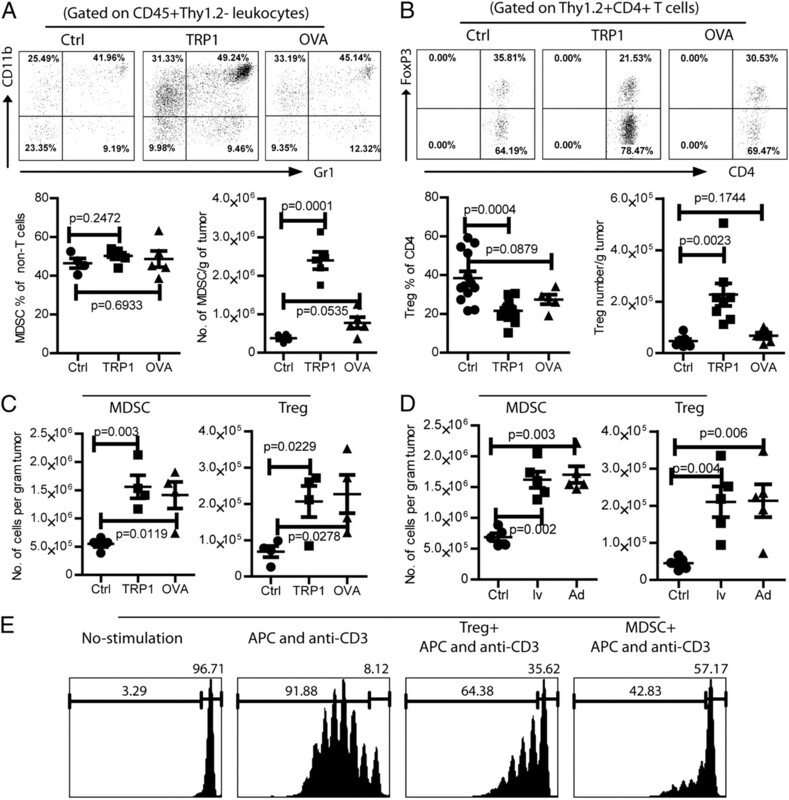 Addition of MDSCs or Tregs strongly inhibited αCD3-stimulated CD4 T cell proliferation (Fig. 2E), suggesting that MDSCs and Tregs from tumor lesions of lv-immunized mice were immune suppressive. The above data indicate that lv immunization markedly increases tumor infiltration of effector CD8 and CD4 T cells (Teff cells), but also increases the absolute number of suppressive MDSCs and Tregs in the tumor lesions. To better understand the immune balance in the tumor lesions after immunization, we calculated the ratios of CD8/MDSC, CD8/Treg, and CD4 Teff cells/Treg in the tumor lesions. Lv TRP1-lv immunization increased the ratios of Teff cells over MDSCs and Tregs in the tumor lesions (Supplemental Fig. 3). Thus, the data demonstrated that tumor infiltration by immune Teff cells is more pronounced than that by MDSCs and Tregs, which may explain why lv immunization did inhibit tumor growth. We hypothesized that in addition to the above extrinsic suppressive components of Tregs and MDSCs, tumor-infiltrating immune effector cells may be intrinsically dysfunctional in the tumor microenvironment. One of the intrinsic mechanisms of immune dysfunction occurs via the PD-1/PD-L1 pathway (33). Lv immunization markedly increased the TILs in the tumor lesions (Fig. 1). However, TILs are exposed to high concentration of tumor Ag for a prolonged period of time, which can lead to the upregulation of PD-1. Indeed, the expression of PD-1 on CD8 TILs progressively increased and paralleled the tumor growth (Fig. 3A). By day 19, CD8 TILs began to show modest increase of PD-1 expression, and in day-26 tumors, there was a substantial elevation in the PD-1 levels on CD8 T cells. In addition, there was a correlation between PD-1 expression and the size of the tumor (Fig. 3B). For example, ~40% of CD8 TILs were found to be PD-1+ in a small 30 mg tumor; whereas PD-1+ CD8 TILs in a larger 168 mg tumor reached 60%. However, immunization did not further change the proportion of PD-1+ CD8 T cells and the level of PD-1 (Fig. 3A). In contrast with the marked increase of PD-1 on TILs, no obvious PD-1 elevation was found on the spleen CD8 T cells. PD-1 expression on TILs increases with tumor growth, and the PD-L1 expression is induced in tumor lesions by lv immunization. A and B, Single-cell suspensions from the spleen and tumor of the immunized or nonimmunized control mice were collected at indicated time points and stained with CD45, Thy1.2, CD8, and PD-1 Abs. CD8 T cells were gated, and the PD-1 expression was analyzed (A). PD-1 expression on the CD8 TILs from tumors of different sizes was compared (B). The numbers represent the percentage of PD-1+ CD8 T cells in the tumor. Shaded area, isotype staining control; dotted line, spleen CD8 T cells; solid line, CD8 TILs. C, To investigate the PD-L1 expression, single cells from the spleen and tumor lesions were stained for CD45, Thy1.2, and PD-L1. Live cell gate was set based on the forward and side scatter. CD45+Thy1.2+ (T cells), CD45+Thy1.2− (non-T leukocytes), and CD45−Thy1.2− (tumor cells) were gated and analyzed for their expression of PD-L1. The numbers on the figure denote the percentage of PD-L1+ cells and the MFI of PD-L1 of the cells from tumor lesions. Shaded area, isotype control; dotted line, splenocytes; solid line, TILs or tumor cells. These figures depict the representative data from five mice. The experiments were repeated three times with similar results. D, In vitro induction of PD-L1 expression on B16F10 cells. B16F10 cells in the culture were treated with or without 10 ng/ml IFN-γ for 12 h and analyzed for PD-L1 expression. Filled histogram represents the isotype control; dashed and solid lines indicate the B16F10 cells without and with IFN-γ treatment, respectively. We next investigated the effect of lv immunization on the induction of PD-L1 expression in the tumor lesions as the PD-1/PD-L1 engagement could induce apoptosis of T cells and protected tumor cells from being killed by CTLs (26, 34). Tumor-infiltrating T cells (CD45+Thy1.2+), non-T leukocytes (CD45+Thy1.2−), and tumor (and stromal) cells (CD45−Thy1.2−) all expressed low-level PD-L1 (Fig. 3C). Lv immunization increased PD-L1 expression (percentage and intensity) on all three populations of cells in the tumor (Fig. 3C). On the other hand, immunization had little effect on the spleen cell PD-L1 expression. The mechanism of immunization-induced PD-L1 expression is not clear. However, it has been reported that IFN-γ treatment could activate PD-L1 gene expression (35). Indeed, while the cultured B16F10 cells were PD-L1 negative, IFN-γ treatment dramatically increased PD-L1 expression (Fig. 3D). Thus, it is likely that the CD8 TILs in the tumor lesions produce IFN-γ in responses to tumor Ag, which increases PD-L1 expression on the tumor cells and TILs. 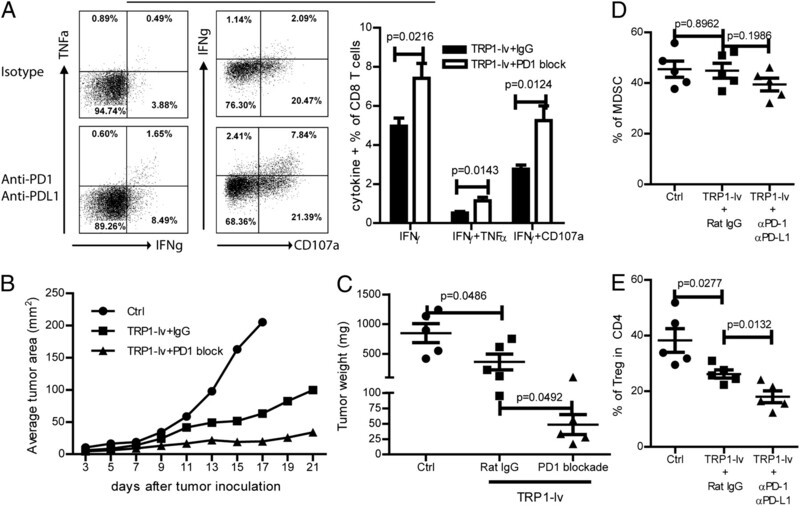 Accumulation of Tregs and MDSCs in the tumor lesions and the increased PD-1/PD-L1 engagement suggest that the function of the CD8 TILs may be compromised in the tumor lesions. The production of multiple effector cytokines, such as IFN-γ and TNF-α, is a well-established indicator of activated T cell function after microbial infection, and it has been suggested that failure to produce multiple cytokines may be related to the stage of exhaustion (36, 37). A much higher percentage of CD8 TILs (~8%) than spleen CD8 T cells (~3%) produced IFN-γ in responses to brief ex vivo stimulation with TRP1 peptides, suggesting that Ag-specific CD8 T cells were preferentially attracted to tumor lesions (Fig. 4A, 4B). However, only ~20% of IFN-γ+ CD8 TILs was also TNF-α+ (Fig. 4A, 4C). By contrast, ~60% of IFN-γ+ CD8 T cells in spleen were also producing TNF-α. Furthermore, the amount (as reflected by the mean fluorescent intensity [MFI]) of IFN-γ and TNF-α produced by CD8 TILs was significantly lower than that produced by the spleen CD8 T cells (Fig. 4D). Because the level of CD107 on the cell surface after Ag stimulation is correlated to the cytolytic function of CD8 T cells (38), we also investigated the degranulation of CD8 TILs by using CD107a as a marker of the cytotoxic activity of CD8 T cells (31). Consistent with the results obtained from cytokine staining, although a higher percentage of CD8 T cells in tumor lesions were capable of degranulation (CD107a+; Fig. 4A), the extent of degranulation (MFI of CD107a) of the tumor CD8 TILs was significantly lower than that of the spleen CD8 T cells (Fig. 4D). This suggests that, compared with spleen CD8 T cells, the degranulation (cytolytic activity) of CD8 TILs is also inhibited. CD8 TILs possess a reduced capability of producing multiple effector cytokines and degranulation. A, Twenty days after tumor inoculation (15 d postimmunization), single-cell suspensions from the spleen and tumor of immunized mice were restimulated in vitro with TRP1 peptides for 3 h and then stained for IFN-γ and TNF-α (top panels). Alternatively, CD107a and IFN-γ staining was performed (bottom panels). Only CD8 T cells were gated and presented in the figures. The numbers in each quadrant of the dot plot represent the percentage and MFI of IFN-γ and TNF-α. B, Summary of the percentage of IFN-γ+ CD8 T cells in the spleen and tumors is presented. C, The percentage of IFN-γ+TNF-α+ double-positive cells out of the total IFN-γ+ cells (left) and the percentage of IFN-γ+CD107a+ double-positive cells out of the total CD107a+ cells (right) is shown. D, The MFI of IFN-γ+, TNF-α+, and CD107a+ CD8 T cells are summarized. This experiment was repeated three times with similar results. E, Pmel-1 CD8 T cells were adoptively transferred into mice before tumor inoculation and immunization. Cytokine production by pmel-1 in the spleen and tumor was measured 15 d after immunization. A representative dot plot is shown (only the pmel-1 cells were gated and presented). The numbers in each quadrant of the dot plot represent the percentage and MFI of each cytokine. The percentage of IFN-γ+TNF-α+ double-positive, IFN-γ+, and TNF-α+ cells from four mice are also summarized (lower panel). Data are presented as mean ± SE. F, Splenocytes (containing pmel-1) were restimulated ex vivo with peptides in the absence or presence of total cells from the tumor lesions (from a separate mouse without pmel-1 cells). Cytokine production from the pmel-1 cells of spleen origin was examined by intracellular staining. A typical dot plot of gated pmel-1 cells is presented. Summary of the IFN-γ+TNF-α+, IFN-γ+, or TNF-α+ percentages of pmel-1 from five mice is also shown (lower panel). Data are presented as mean ± SE. The unpaired t test was used for statistical analysis. Two experiments were performed with similar results. Because there is no reliable tetramer for staining TRP1-specific CD8 T cells, we used the adoptive transfer of TCR transgenic pmel-1 CD8 T cells (39) into C57BL/6 mice to more precisely compare the functional changes of Teff cells between the spleen and tumor by gating on a defined cell population. Adoptive transfer of pmel-1 cells was conducted 1 d prior to B16 tumor inoculation to allow habitation of exogenous T cells in the mice. Immunization with lv hgp100-lv was conducted 5 d after tumor cell inoculation. Cytokine production by spleen and tumor pmel-1 cells was examined 15 d later. As demonstrated in Fig. 4E, although the percentage of IFN-γ–producing pmel-1 cells remained high, the pmel-1 cells capable of producing multiple cytokines was markedly reduced in the tumor lesions. The loss of TNF-α production was especially dramatic in the TILs (Fig. 4E). Thus, the adoptive transfer study confirms that the effector function of CD8 TILs is severely compromised in the tumor microenvironment. To demonstrate further that the loss of effector function was indeed because of the inhibition of the tumor microenvironment, splenocytes containing the pmel-1 cells were cocultured with tumor cell suspension together during ex vivo restimulation. In the presence of total cells of tumor lesions, the spleen pmel-1 cells capable of producing multiple cytokines, especially the TNF-α, was significantly decreased (Fig. 4F), suggesting that the cellular components of tumor lesions could rapidly inhibit the effector function of CD8 T cells. It also implies that when effector T cells enter the tumor microenvironment, their function will be immediately inhibited. The above study showed that CD8 T cell function is partially lost after migrating into tumor lesions. Although all different immune-suppressive components identified above in the tumor lesions can contribute to the loss of effector function of TILs, it is impractical or impossible to remove all the components from the tumor lesions. Because immunization further increases the expression of PD-L1 in the tumor lesions and the PD-1/PD-L1 pathway can be the common immunosuppressive mediator of different cellular components, we studied the possibility of rescuing the effector function of CD8 TILs by PD-1/PD-L1 blockade in vitro. Consistent with that in Fig. 4E, the percentage of IFN-γ and TNF-α double-positive pmel-1 cells from the tumor was significantly lower than that in the spleen. Importantly, the reduced effector function of TIL pmel-1 was partially recovered after treatment with PD-1 and PD-L1 blocking Abs in vitro (Fig. 5), suggesting that the lost effector function of TILs can be partially rescued. In vitro PD-1/PD-L1 blockade partially recovers the lost effector function of CD8 TILs. Splenocytes and total cells of the tumor lesions were prepared from the tumor-bearing mice after pmel-1 adoptive transfer and hgp100-lv immunization. Cells were restimulated ex vivo with peptide in the presence or absence of PD1 and PD-L1 Abs. Cytokine production was determined by intracellular staining of IFN-γ and TNF-α. A representative result with five mice is presented. Next, we studied the possibility of rescuing the effector function of CD8 TILs in vivo by blocking the PD-1/PD-L1 engagement using PD-1 and PD-L1 Abs. Mice bearing 5 d B16F10 tumors were immunized with TRP1-lv and treated with αPD-1 and αPD-L1 Abs or control isotype Ab. Compared with the mice injected with isotype Ab, injection of PD1 and PD-L1 Abs markedly increased the effector functions of CD8 TILs (Fig. 6A). Frequency of IFN-γ+, IFN-γ+TNF-α+, IFN-γ+CD107a+ CD8 T cells were all significantly increased. In addition, the antitumor efficacy of TRP1-lv immunization was markedly enhanced by administration of PD1 and PD-L1 Abs (Fig. 6B). The tumor weight at the end of experiment also showed that PD-1 and PD-L1 Abs significantly improved the antitumor efficacy of TRP1-lv immunization (Fig. 6C). The likely mechanism for rescuing the effector function is via direct blockade of PD1 signaling on CD8 TILs. However, because the PD-L1 expression was found to regulate development of Tregs (40, 41), we analyzed the effect of in vivo PD-1/PD-L1 blockade on the prevalence of MDSCs and Tregs in the tumor lesions. The data showed that PD-1/PD-L1 blockade further reduced the percentage of Tregs (Fig. 6E) in the tumor lesions even though it has little effect on the frequency of MDSCs (Fig. 6D). Thus, it is likely that PD-1/PD-L1 blockade may also indirectly enhance the effector function of CD8 TILs by reducing the Treg-mediated inhibition in the tumor lesions. In vivo PD-1/PD-L1 blockade partially recovers the effector function of CD8 TILs and enhances the antitumor efficacy of lv immunization. A, Mice bearing 5-d B16F10 tumors were immunized by TRP1-lv with PD1 and PD-L1 Ab or Rat IgG isotype Ab. Tumor cell suspensions were prepared and stained for cytokines and CD107a. Only CD8 T cells are shown in the representative dot plots. A summary of the cytokine production (mean ± SE) from five mice in each group is presented. B and C, Tumor growth was monitored, and the average tumor area of five tumors in each group is shown (B), and tumor weight was recorded at the end of the experiment (C). D and E, The percentages of MDSCs (D) and Tregs (E) in the tumor lesions was analyzed as described in Fig. 2. The unpaired t test was used for statistical analysis. The experiment was repeated twice with similar results. To more specifically analyze the in vivo recovery of effector function by PD-1/PD-L1 blockade, we injected pmel-1 CD8 T cells into B16 tumor-bearing mice before immunization and PD-1 and PD-L1 Ab injection. Consistent with data of Fig. 4E, the production of both IFN-γ and TNF-α effector cytokines by pmel-1 cells were significantly reduced in the tumor lesions compared with that in the spleen (Fig. 7A). The degranulation of pmel-1 was also markedly reduced (Fig. 7B). Importantly, in vivo administration of PD-1 and PD-L1 Abs partially recovered the function of pmel-1 (Fig. 7A, 7B). The frequency of IFN-γ+, IFN-γ+TNF-α+, IFN-γ+CD107a+ in the CD8 TILs increased from ~30, ~7, and 20% to ~50, ~15, and ~40%, respectively (Fig. 7D). But the effector function was never fully recovered to the level of the CD8 cells in the spleen (Fig. 7C). The increase of effector function of CD8 TILs was accompanied by improved antitumor efficacy of lv hgp100-lv immunization (Fig. 7E). The tumor weight at the end of the experiments also reflected the better antitumor effect of hgp100-lv immunization by PD-1 and PD-L1 Abs (Fig. 7F). Compared with data in Figs. 1D and 6C, the slightly lower tumor weight (though statistically insignificant) in the control group was possible due to the adoptive transfer of TCR transgenic pmel-1 cells (Fig. 7F). In summary, these data suggest that in vivo PD-1/PD-L1 blockade can recover part of the lost effector function of CD8 TILs in the tumor microenvironment and markedly enhanced the antitumor efficacy of lv immunization. In vivo PD-1/PD-L1 blockade partially rescues the effector function of pmel-1 in the tumor lesions. A–D, Mice were adoptively transferred with pmel-1 cells and inoculated with B16F10 tumor cells. Mice bearing 5-d tumors were immunized with hgp100-lv with either αPD-1 and αPD-L1 Abs or isotype Ab. Single cells were prepared from spleen and tumor lesions, and their effector function was determined by ex vivo staining. Representative dot plots (gated pmel-1 cells) of multiple cytokine production (A) and degranulation (B) are presented. The numbers in each quadrant represent the percentage of positive cells and the MFI of indicated cytokines of each population. The cytokine production of pmel-1 cells in both spleen (C) and tumor (D) is summarized from five mice. E and F, Tumor growth curve (E) of each treatment group and tumor weight (F) at the end of the experiments are also summarized and presented. Each line represents an individual mouse. These experiments were repeated twice with similar observations. The aim of this study is to elucidate the effect of lv immunization on the cellular immune-suppressive components in a tumor microenvironment and to study whether the effector function of TILs can be rescued to enhance the antitumor efficacy of lv immunization. We found that lv immunization markedly increased tumor infiltration of CD8 and CD4 Teff cells but also increased the absolute number of immune-suppressive cells (MDSCs and Tregs) in the tumor lesions. The effector function of CD8 TILs was severely compromised possibly by the extrinsic MDSCs and Tregs and by the intrinsic PD-1/PDL1 engagement. Blockade of PD-1 and PD-L1 partially rescued the effector function of CD8 TILs both in vitro and in vivo and significantly enhanced the antitumor efficacy of lv immunization. The tumor microenvironment is highly immune suppressive (23). In this study, we showed that immune suppression in tumor lesions was rapidly established as early as day 5 after tumor inoculation (Supplemental Fig. 1). When the mice bearing 5-d B16 tumors are immunized with lv, it takes another week before Teff cells are expanded to a measurable level (5). By this time, the tumor microenvironment is fully equipped with myriad immune-suppressive cells (day 12 on Supplemental Fig. 1). The suppressive conditions represent a considerable obstacle that the Teff cells must overcome to kill tumor cells effectively. Unfortunately, although lv immunization does stimulate CD8 Teff cell infiltration, it also increases the number of MDSCs and Tregs in the tumor lesions (Fig. 2A, 2B) and the inhibitory PD-1/PD-L1 engagement (Fig. 3); thus, the established suppressive conditions in the tumor lesion were reinforced after immunization, resulting in marked decrease of cytokine production by CD8 TILs (Figs. 4, 7A). Thus, even though lv immunization stimulated more Teff cell infiltration (10- to 15-fold increase of effector CD8 T cells versus 5- to 6-fold increase of Tregs and MDSCs), only limited antitumor efficacy was observed. The accumulation of more MDSCs and Tregs in the tumor lesion is due to the lv per se as Ad immunization stimulated similar effect (Fig. 2D). Tumor vaccines are intended to activate and expand tumor Ag specific T cells, which then infiltrate into tumor lesions because of the abundant tumor Ags in the tumor microenvironment. But it is less intuitive to comprehend that immunization causes the increased accumulation of MDSCs in the tumor lesions. It is unlikely that immunization will expand MDSCs. However, tumor growing increases MDSCs in the spleen. It is possible that MDSCs in the tumor may come from the circulation (42) and that the inflammatory cytokines/chemokines produced by TILs increase the MDSC accumulation in the tumor lesion. Likely, the mechanisms of increasing Treg accumulation in the tumor lesions by immunization are not known. It is not clear if lv can stimulate Treg amplification as it was demonstrated in vaccinia vector immunization (43). However, MDSCs in the tumor lesion may mediate Treg development in the tumor (44), and PD-L1 expression that was induced in the tumor microenvironment was also found to regulate development of Tregs (40, 41), suggesting that Tregs may be produced locally in the tumor lesions. Our data of PD-1/PD-L1 blockade decreasing Tregs in the tumor lesions (Fig. 6E) is consistent with this hypothesis. Furthermore, inflammation is commonly associated with most immunization formulations including recombinant viral vectors and can activate IDO (45), which stimulates Treg activity in the tumor and tumor-draining lymph nodes (46). Thus, it is possible that immunization may also trigger the IDO activity in the tumor microenvironment, which regulates the effectiveness of immune responses. But those mechanisms of immune regulation remain to be studied. The CD8 TILs were capable of producing effector cytokine IFN-γ but at reduced levels in the tumor lesions (Fig. 4). These incompletely exhausted CD8 TILs may partially exert their function and mediate tumor killing (as they can degranulate; Fig. 4A) but at the same time induce PD-L1 expression on the tumor-infiltrating leukocytes and tumor (and stromal) cells possibly via an IFN-γ–dependent pathway (Fig. 3C) (35). Although the accumulation of MDSCs and Tregs in the tumor lesions occurs at an early stage when the tumors are small (Fig. 2), the expression of PD-1 on CD8 TILs requires a longer Ag exposure time and is dependent on the age and size of the tumor. This is consistent with the findings of a previous report, in which prolonged Ag exposure could increase the levels of PD-1 expression in chronic viral infections (47). With the advancing growth of a tumor, the PD-1 expression on CD8 TILs (Fig. 3A, 3B) and the induced expression of PD-L1 (Fig. 3C, 3D) on tumor cells can result in stronger inhibitory engagement of PD-1/PD-L1. This interaction could lead to the apoptosis of T cells (26) and/or prevention of the cytotoxic killing of tumor cells by Teff cells (34, 48). PD-1/PD-L1 blockade was previously demonstrated to potentiate therapeutic antitumor efficacy (34, 49). In this study, we found that part of the improved antitumor efficacy may result from the recovered TIL effector function in the tumor lesions. Both in vitro and in vivo PD-1/PD-L1 blockade resulted in enhanced production of cytokines. In addition, the decrease of Tregs in the tumor lesions by PD-1/PD-L1 blockade (Fig. 6E) may also help rescue the effector function of CD8 TILs. However, because the tumor lesions are also infiltrated with Tregs and MDSCs and soluble inhibitory factors (such as TGF-β and IL-10), it is no surprise that effector function of CD8 T cells was recovered only partially by PD-1/PD-L1 blockade, which further attests to the need of counteracting multiple immune-suppressive mechanisms existing in the tumor microenvironment. In conclusion, in this study, we found that immunization with lv stimulated potent CD8 Teff cell responses and markedly increased the Teff cell infiltration into tumor lesions, resulting in potent antitumor effect. However, immunization also attracted more immune-suppressive cells such as MDSCs and Tregs into the established tumor microenvironment and increased inhibitory PD-1/PD-L1 engagement, which may limit antitumor efficacy of tumor vaccines. Blockade of PD-1/PDL1 signaling can partially rescue the effector function of CD8 TILs and enhance the antitumor efficacy of lv immunization. This study allows us to understand the effect of immunization on immune regulations in the tumor microenvironment but also implies that interference with the immune suppression can enhance the antitumor efficacy of tumor vaccines. The data provide a strong rationale for incorporating multiple approaches to reverse the immune suppressions in the tumor microenvironment, stressing the importance of combinatorial approaches for tumor immunotherapy to improve the antitumor efficacy of current immunization approaches (50, 51). We thank Dr. Janice Sabatine and Dr. Stephen Towers for editing assistance. This work was supported by National Institutes of Health Grant R01 CA116444 and by the Distinguished Investigator of Vaccine Research Fund from Georgia Research Alliance (to Y. He).
. 2007. Plasmid DNA and viral vector-based vaccines for the treatment of cancer. Vaccine 25(Suppl 2): B24–B34.
. 2006. Skin-derived dendritic cells induce potent CD8(+) T cell immunity in recombinant lv-mediated genetic immunization. Immunity 24: 643–656.
. 2005. Immunization with lentiviral vector-transduced dendritic cells induces strong and long-lasting T cell responses and therapeutic immunity. J. Immunol. 174: 3808–3817.
. 2009. Lv immunization stimulates potent CD8 T cell responses against melanoma self-antigen tyrosinase-related protein 1 and generates antitumor immunity in mice. J. Immunol. 182: 5960–5969.
. 2006. New generation vaccine induces effective melanoma-specific CD8+ T cells in the circulation but not in the tumor site. J. Immunol. 177: 1670–1678.
. 2006. Tumor progression despite massive influx of activated CD8(+) T cells in a patient with malignant melanoma ascites. Cancer Immunol. Immunother. 55: 1185–1197.
. 2004. Effector function of human tumor-specific CD8 T cells in melanoma lesions: a state of local functional tolerance. Cancer Res. 64: 2865–2873.
. 2008. Tumour immunity: effector response to tumour and role of the microenvironment. Lancet 371: 771–783. 2005. Immunosuppressive networks in the tumour environment and their therapeutic relevance. Nat. Rev. Cancer 5: 263–274. 2007. Tregs and rethinking cancer immunotherapy. J. Clin. Invest. 117: 1167–1174.
. 2007. Regulatory T cells prevent CD8 T cell maturation by inhibiting CD4 Th cells at tumor sites. J. Immunol. 179: 4969–4978.
. 2008. Homeostatic proliferation plus regulatory T-cell depletion promotes potent rejection of B16 melanoma. Clin. Cancer Res. 14: 3156–3167.
. 2005. Intratumor depletion of CD4+ cells unmasks tumor immunogenicity leading to the rejection of late-stage tumors. J. Exp. Med. 201: 779–791.
. 2006. Immune suppression in the tumor microenvironment. J. Immunother. 29: 233–240.
. 2002. Tumor-associated B7-H1 promotes T-cell apoptosis: a potential mechanism of immune evasion. Nat. Med. 8: 793–800.
. 2007. PD-1 is expressed by tumor-infiltrating immune cells and is associated with poor outcome for patients with renal cell carcinoma. Clin. Cancer Res. 13: 1757–1761.
. 2008. PD-1-PD-1 ligand interaction contributes to immunosuppressive microenvironment of Hodgkin lymphoma. Blood 111: 3220–3224.
. 2009. Self-antigen-specific CD8+ T cell precursor frequency determines the quality of the antitumor immune response. J. Exp. Med. 206: 849–866.
. 2005. 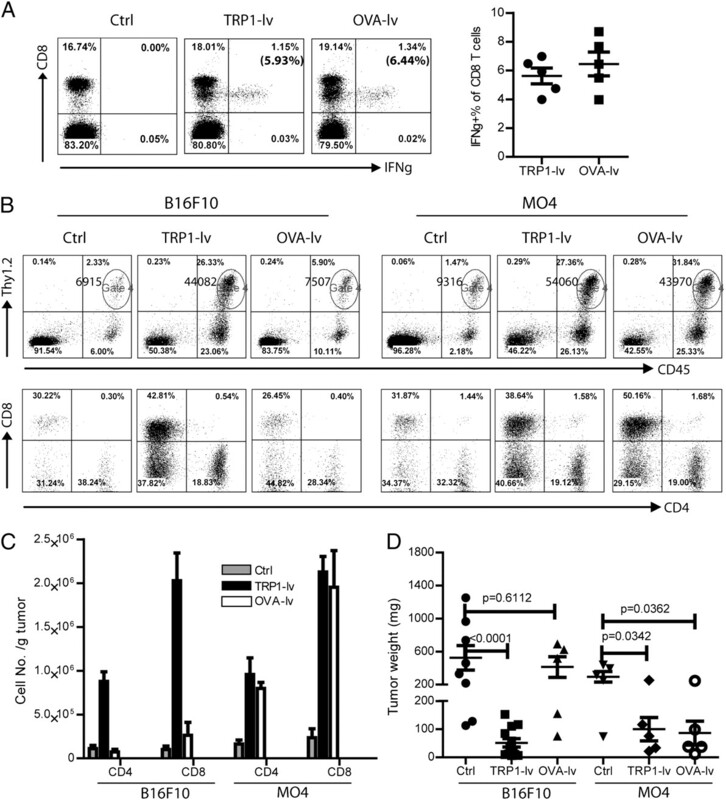 Blockade of B7-H1 on macrophages suppresses CD4+ T cell proliferation by augmenting IFN-gamma-induced nitric oxide production. J. Immunol. 175: 1586–1592.
. 2005. Blockade of B7-H1 and PD-1 by monoclonal antibodies potentiates cancer therapeutic immunity. Cancer Res. 65: 1089–1096.
. 2004. PD-L1/B7H-1 inhibits the effector phase of tumor rejection by T cell receptor (TCR) transgenic CD8+ T cells. Cancer Res. 64: 1140–1145.
. 2003. Ex vivo identification, isolation and analysis of tumor-cytolytic T cells. Nat. Med. 9: 1377–1382.
. 2009. PD-L1 regulates the development, maintenance, and function of induced regulatory T cells. J. Exp. Med. 206: 3015–3029.
. 2008. Programmed death 1 ligand signaling regulates the generation of adaptive Foxp3+CD4+ regulatory T cells. Proc. Natl. Acad. Sci. USA 105: 9331–9336.
. 2007. Altered macrophage differentiation and immune dysfunction in tumor development. J. Clin. Invest. 117: 1155–1166.
. 2006. 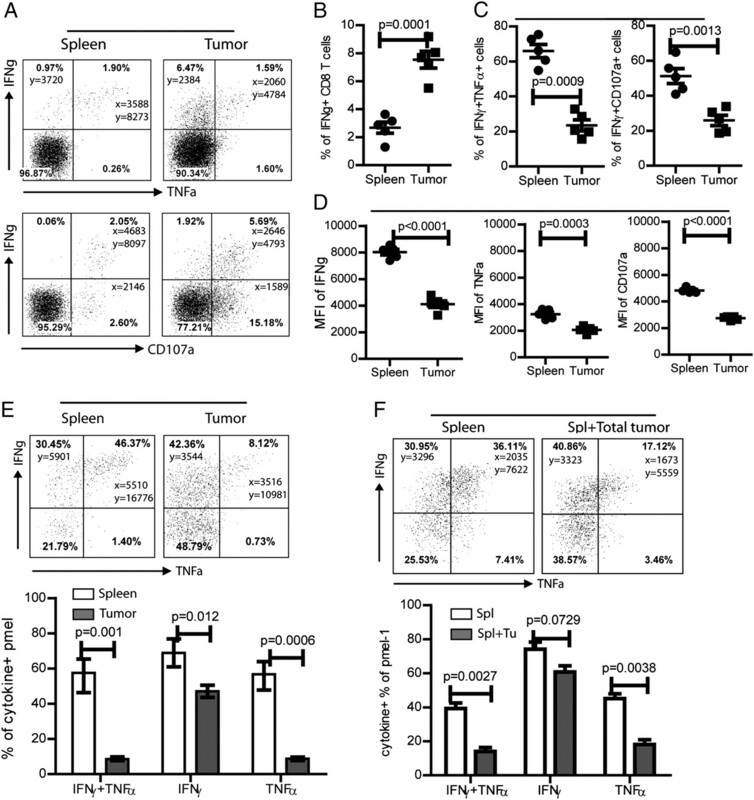 Amplification of tumor-specific regulatory T cells following therapeutic cancer vaccines. Blood 107: 628–636.
. 2005. 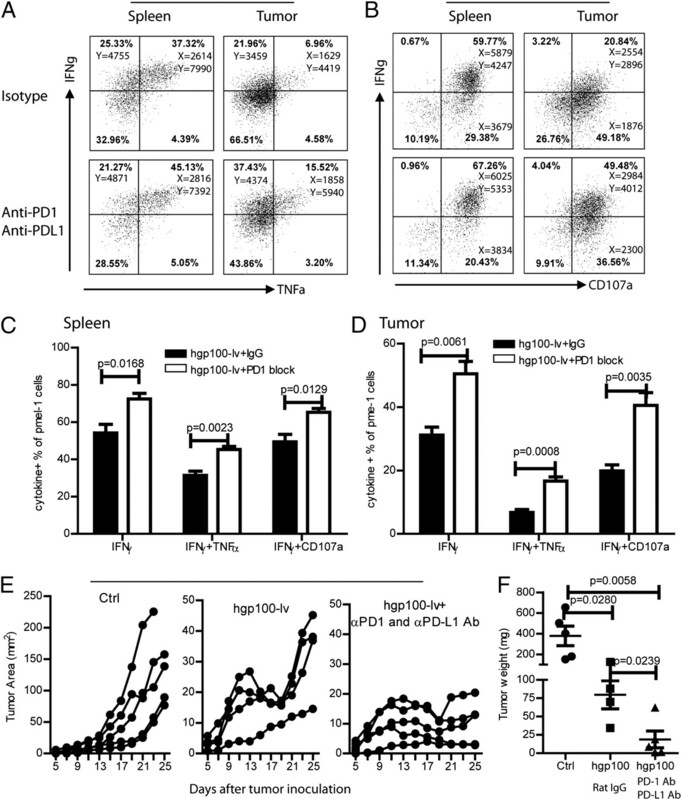 Cutting edge: CpG oligonucleotides induce splenic CD19+ dendritic cells to acquire potent indoleamine 2,3-dioxygenase-dependent T cell regulatory functions via IFN type 1 signaling. J. Immunol. 175: 5601–5605.
. 2007. Plasmacytoid dendritic cells from mouse tumor-draining lymph nodes directly activate mature Tregs via indoleamine 2,3-dioxygenase. J. Clin. Invest. 117: 2570–2582.
. 2008. B7-H1 is a ubiquitous antiapoptotic receptor on cancer cells. Blood 111: 3635–3643.
. 2003. B7-H1 blockade augments adoptive T-cell immunotherapy for squamous cell carcinoma. Cancer Res. 63: 6501–6505.
. 2009. Complete regression of advanced primary and metastatic mouse melanomas following combination chemoimmunotherapy. Cancer Res. 69: 6265–6274.
. 2009. OX40 engagement and chemotherapy combination provides potent antitumor immunity with concomitant regulatory T cell apoptosis. J. Exp. Med. 206: 1103–1116.